From the makers of Despicable Me comes a film with more despicable characters than Despicable Me. 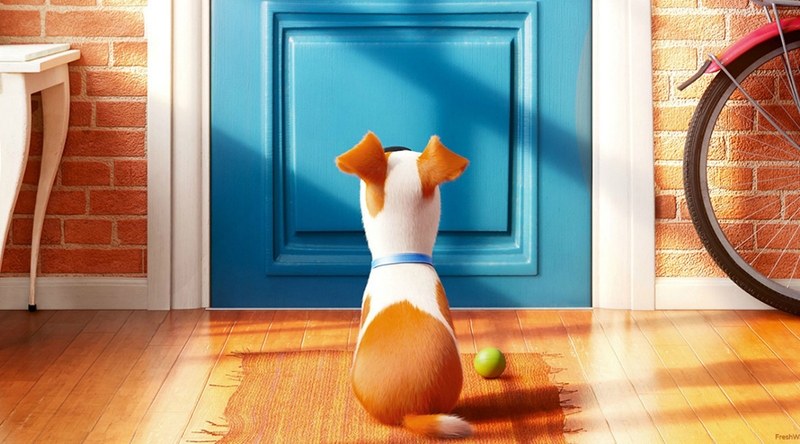 In truth, of course, there are no truly despicable characters in Despicable Me but the same can’t be said for The Secret Life Of Pets. Lovable lost and found hound, Max (Louis C.K. ), gets his nose out of joint when his owner brings home another stray dog, Duke (Eric Stonestreet). In a fit of jealousy over the loss of his singular place in his owner’s heart, Max does a series of not very nice things to Duke in order to foster disfavour between the newcomer and their owner. Duke responds by doing some not very nice things in return, the result of which is the pair getting some not very nice things done to them by a gang of mean spirited alley cats. After the cats snip the pair’s ID tags, the two are whisked away by some not very nice dog catchers only to be subsequently released from their ‘prison’ by some not very nice ex-pets who are plotting a revolution from the city’s sewers and… well… you get the picture. Even Max’s unrequited love interest, cute fluffball Gidget (Jenny Slate), has a mean streak when it comes to protecting her betrothed. It’s a kid’s movie with a gangsta flavour and it leaves a sour taste. Of course, Pets are really like this. They’re naturally selfish, jealous creatures – and we love them all the same – but this is fantasy and we need characters we can fall in love with. And when just about every character is rocking this ugly gangsta shtick, it’s a struggle to find a likeable character in The Secret Life Of Pets. The story structure is almost non-existent. The tale merely starts from the beginning and then meanders to its predictable conclusion with very little in the way of defined acts. As a result, it feels aimless, a road trip of a movie that ponies up one unlikeable character after another. The film is peppered with funny vignettes on pet behaviour that are true to tone and keep the proceedings watchable, at least. The best of these vignettes, however, were contained in the films original teaser trailer which culminated in Leonard, the death metal, head bangin’ poodle – and this remains the best joke in the film.